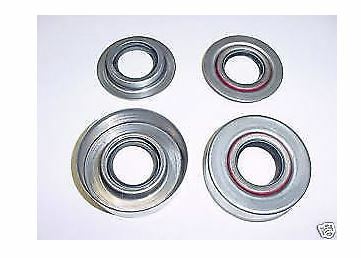 Anyone have reviews on the modern outer axle seals like these sold by Snyder's? Do they work better than the felt seal and do the surface of your axles have to be like new for them to seal properly? You need to have perfect bearings with "zero" radial slop or these will tear up in no time. Grease doesn't so much as come out on it's own, as differential oil dilutes the grease, which then migrates out. Given this, inner seals work much better at keeping oil with oil, and grease with grease. They are very flexible and withstand much more radial misalignment as well. Once you do this, the felts work pretty darn well. Also, most WHEEL felts are missing and few know that one belongs there (felts belong inside and OUTSIDE the original metal retainer cups. Uh...Scott, when I check the diagrams and Lang's catalog I only see one felt inside the retainer cup, none outside.... Am I missing something? I plan to use modern seals inside the axle and from what I read the felt seals would then be more than adequate. I take it you agree? I used them with no problems. I also used the inner ones also. I have switched to safety hubs so no longer need them. I did have problem getting them off though. I agree... Modern seals inside the axle, felt seal inside the metal cup, then a felt seal between the metal cup and the hub. https://www.modeltford.com/item/2809.aspx This is the seal. 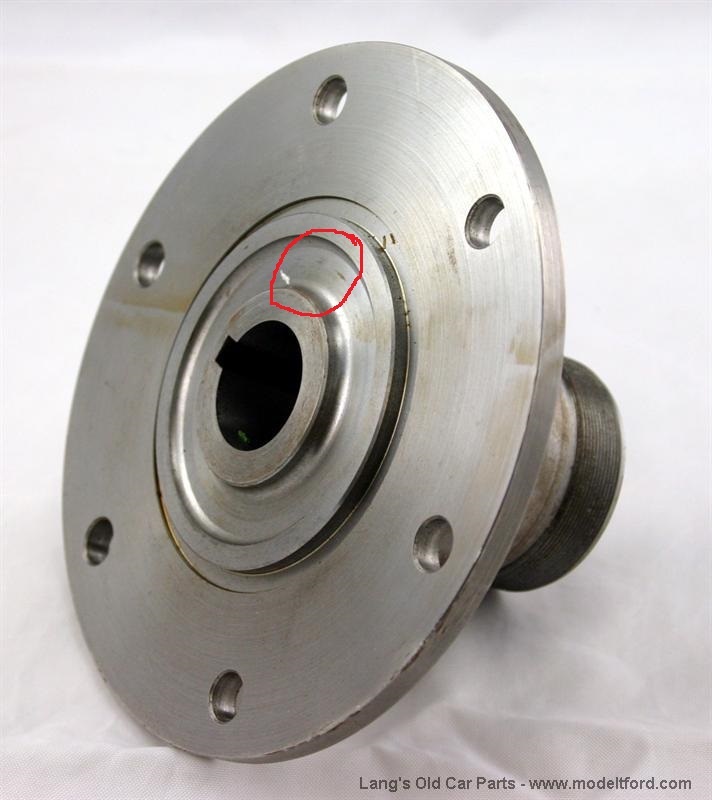 It fits the machined recess of the hub...It is probably the most overlooked seal on the car and can guarantee that you are not the only one reading this post that didn't know that. You need to find a really unmolested, original car to find a seal on the hub. 99% of the time it is missing, but trust me, one belongs there. I use the modern seals on the outside of my car. On a friends car the modern seals started to leak. They started turning on the axle housing. We glued them on with some strong Loctite and he has not had a problem since. I glued mine on. If they need to come off in the future, some heat will soften the Loctite. One thing to watch for is if the axle keyway extends under the neoprene lip of the seal. It won't seal and will damage the seal. One of my axles is thus, so use the felt seal on that side, and the neoprene seal the other side. Both work fine, but I also have the neoprene seals on the inner side of the bearings. Thanks for all the information guys! This is important information about the "extra" felt seal outside the retainer. Lang's says you only need two per rearend, not four. MTFCA rear end manual makes no mention of it. So for verification I checked the Model T Ford Service Manual. Its final instruction on rebuilding the rear end says "Install wheel as outlined in pars 74 and 76, making sure that the hub felt is in place on the hub." Thanks for the education Scott; I will be checking my hubs for this seal in the future. Actually, Lang's is right though it may appear confusing. This seal (2x) for the rear end is DIFFERENT than the seal inside the cup on the rear end; i.e. there are four felt seals on the rear end...2 small bore which come with the metal retaining cup and washer, and 2 large bore (which everyone leaves out), thus they are telling you that you only need two (of the hub seals). It is coincidentally the same felt as was originally used for the front wheel seal. Scott - please accept my appreciation for pointing out the existence of felt seals on the wheel hubs. I looked at my rears (which are off for painting) and neither one had the felt seal. Not knowing any better, I would have reassembled them that way had it not been for your timely comment. That raises another question - should the felts (both the outer axle seal and the one on the wheel hub) be installed dry or greased? I don't know what the fitting instructions say today for the modern seals but back when they first can out if I remember correctly, to over come the seal running on the key way was to cut the axle housing and bearing sleeve back 1/8"? and to avoid the hub from running against the seal was to turn the inner lip of the hub. That would make the felt seal redundant for fitting so of no importance to be there. Scott...the seal you posted about, is this strictly for wooden wheel hubs or do the 26-27 wire wheel hubs require this also ? I am nearly certain that 26-27 drums take them, too. If I recall correctly, there is a recess in the hub that matches the felt. I say NEARLY because it has been years since I serviced anything on an Improved Ford, and longer since I pulled a rear hub on one. Scott, I have been messing with model Ts over 40 years. This is something I have never heard of before. Your photo and Ralphs quote from the service manual, pretty much sums it up. They say you are never too old to learn something new. Today I learned something new. Thank you for taking the time to post this. If your outer seal is leaking oil it is a sign that your inner seal is bad. The felt should have no problem holding the grease in place. I just went out and looked at a couple of 26-27 hubs. The large drum wood wheel hub as the recess for the felt, the hub for a wire wheel does not. To clarify, Scott's "missing felt" is part 2509 in Lang's online catalog, but it does not even show up in my print copy of the catalog. The felt that fits inside the axle bearing cap is part 2510. Now to confuse the issue, my price list of parts dated 1928 does not list the outer hub felt, just the 2510 part. Did Ford decide it was no longer necessary? Oops, I misread the part number for the missing felt; it is 2809, not 2509 and it is listed in Lang's print catalog, just not with the rear axle parts. It's on page 38 with the front hub parts. you just did me a favour, on checking on the wire wheel hubs in my stash of parts, I found a pair of brake shoes I have been looking for! inside the drums. Anyway, 4 rear 27 wire wheel hubs and all have the felt, 3 still have it place. Maybe Canadian continued using the felt but not USA? RalphS, thanks for adding where the number can be found I was just going to add that, that's it's the same as the front felt seal. Frank, I took a better look at my wire wheel hub in the daylite with a screwdriver. I does have the groove, it was just full of hard grease. I always wondered what that felt with the large hole was for when ever I ordered a gasket kit. Also there is another neoprene seal available from Antique Motor Sports. I have used these with good results. I have the same outer seals that I installed back in the late 1960's that were made by John Watts, maker of the original Watts clutch. The caps are cast, as the ones from Snyders appear to be. The ones from Antique Motor Sports, appear to be machined; not cast. Those that John just posted made by Bill Bohlen work very well. Working on a TT rear end. From what I can find looking at the Drivers manual and parts book, the outer cap was just a bearing retainer and the seal road in the same type groove in the hub, only a lot bigger. Just to add some more fuel to the fire in the 1915 parts book the REAR AXLE FELT is part number 2510B, the 2510 is the metal cup the felt fits into. The REAR HUB FELT is part number 2829, and the FRONT FELT WASHER was part number 2809. Some time after 1915 in the 1921 parts book the rear hub felt number 2829 was discontinued because the front felt was the same as the rear hub felt. 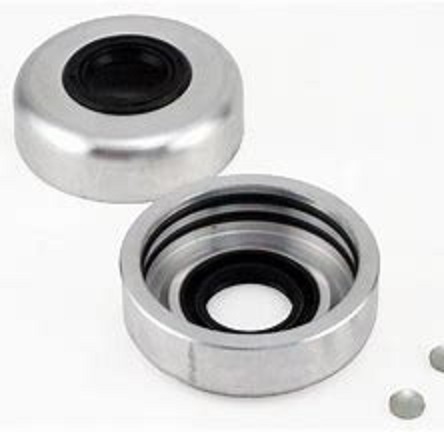 We seem to have drifted away from the intent of the felt washers they were never referred to as SEALS their design was to prohibit dust from entering the bearing assemblies and not to keep grease in. The housings were assembled with 1.5 - 2 pounds of grease however that grease has given way to oils that will flow and leak past the dust felts today referred to as SEALS which they never where. If you read the parts books correctly there are four felts in the rear ends two AXLE felts and two HUB felts, the two rear HUB felts are the same as the two front DUST felts. The set should consist of six felts in total. Langs does have them listed correctly, you have to look for them.